Not only was this game a farce, from a Waterford point of view, but it is beginning to look as though our new selectors are a farce too. If they weren’t bothered about winning this game (and that’s the way it looked) they could have told us in advance, so that the thousand or so people who turned up could have saved themselves the €10 admission fee and cost of getting to the game. There has been no apparent sense of purpose in the selection of teams in the Crystal Cup and pre-season challenges. There has been no systematic rotation of players so that all available players on the panel could get a decent chance in their best positions. Instead, some established players have played in all the games, while some squad members have hardly figured at all. Several players are on the panel and getting games although it should be obvious by now that they are not fit for championship hurling. Michael Ryan has been criticised for having a number of Fourmilewater players on the panel, although we have seen very little of them. Yet it seems to me that there are a lot of Mount Sion and De La Salle players in the squad who have no business being there. What has Eoin McGrath done to deserve a place on the panel, never mind on the team? What particular function is he supposed to perform? He played the entire game today, first at corner forward, then at midfield, then at left half forward – all to no effect, while young players with potential were left on the sideline. From what I have seen, Dean Twomey is nowhere near the level required in terms of technique or ball control. He was eventually replaced by another De La Salle player, Paudie Nevin, who in my view is not up to intercounty standard either. I have nothing against Mount Sion or De La Salle, but there are much better players than those mentioned who are not getting a look in. Clare had four of last year’s minor team playing today, and all played well. Waterford have had three good minor teams in the last three years, yet only one player from these teams (Martin O’Neill) played today. Why, when the team was doing so badly today, were only two substitutes used (and even then, one was an enforced substitution) while Clare used four substitutes? Some of the tactics employed today defied comprehension. Waterford used a three-man midfield in the second half, even though they were chasing the game. This left them with a two-man full forward line of Shane Walsh and Martin O’Neill, neither of whom is blessed with pace. They were being marked by three pacy defenders, so predictably most of the ball that came in came straight back out again. Waterford eventually reverted to an orthodox forward layout with Seamus Prendergast moving to full forward and, hey presto, they scored three goals and brought two excellent saves from the Clare goalie. And this without any presence on the left wing, where the Clare right half back was cleaning up on Eoin McGrath. At least Maurice Shanahan was winning loads of ball on the other wing, and he worked his socks off, even though his use of the ball wasn’t the most productive. A couple of statistics from the game. Waterford got two points from play (both by Shane Walsh); Clare got thirteen. Three Waterford players scored from play (Martin O’Neill and Seamus Prendergast got two goals each); the corresponding figure for Clare was ten. Tony Kelly came on for Clare wearing No, 25 and scored a peach of a long range point. Finally, congratulations to Dungarvan CBS, who beat Clonmel CBS in the semi-final of the Munster Colleges Senior B competition on Saturday, despite being short a lot of players due to injuries and suspensions. Update: My apologies, I was wrongly informed. The Kelly who came on for Clare yesterday was Patrick, not Tony. My information now is that Tony, who was the star of the Clare minor hurlers over the last two years, was invited onto the senior panel but opted to return to school to repeat the Leaving Cert. This means that Clare only had three of last year’s minors on the team yesterday. 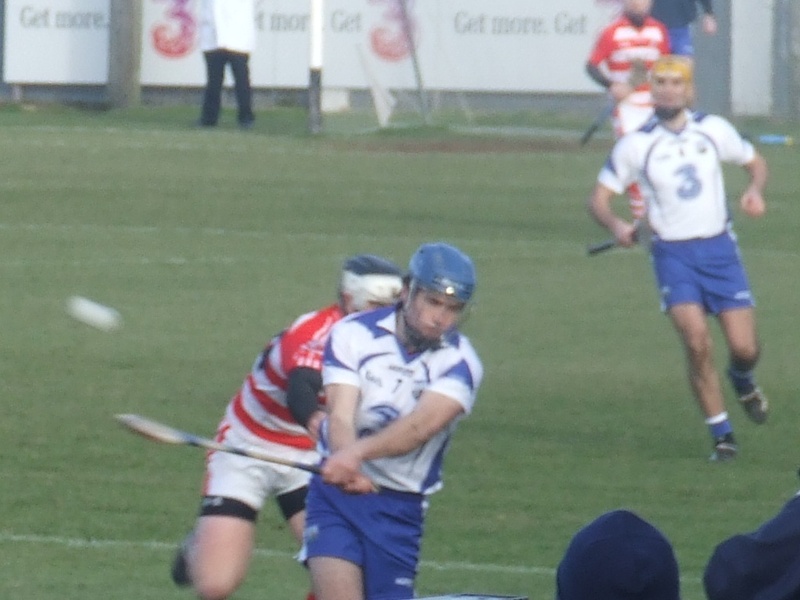 This entry was posted in Hurling, Match Reports, Waterford and tagged Clare, Michael Ryan, Walsh Park, Waterford Crystal Cup on 14/02/2012 by deiseach. This entry was posted in Hurling, Waterford, Waterford gallery and tagged Clare, Waterford Crystal Cup on 12/02/2012 by deiseach. It’ll be a cold day in Hell when I get no pleasure from beating Cork, the county whom we have played most often in the championship (60 times), beaten most often (13) but to whom we have lost most often (42). So well done to the hurlers on retaining the Waterford Crystal Cup, beating Cork by 0-21 to 0-15 in Páirc Uí Rinn. It was an alarmingly inexperienced Cork team with only Martin Coleman ringing any bells, although the more experienced subs shows that even when you send out an experimental team the desire to win does take over. The Waterford team looked far stronger, and one wonders whether it is already taking shape in the Codyesque notion of going out to win every game. Perhaps Cork have only learned who is not good enough rather than anyone who can make the grade. Jeez, he doth protest too much. Again, well done to all concerned. Up next – Dublin in the NHL. 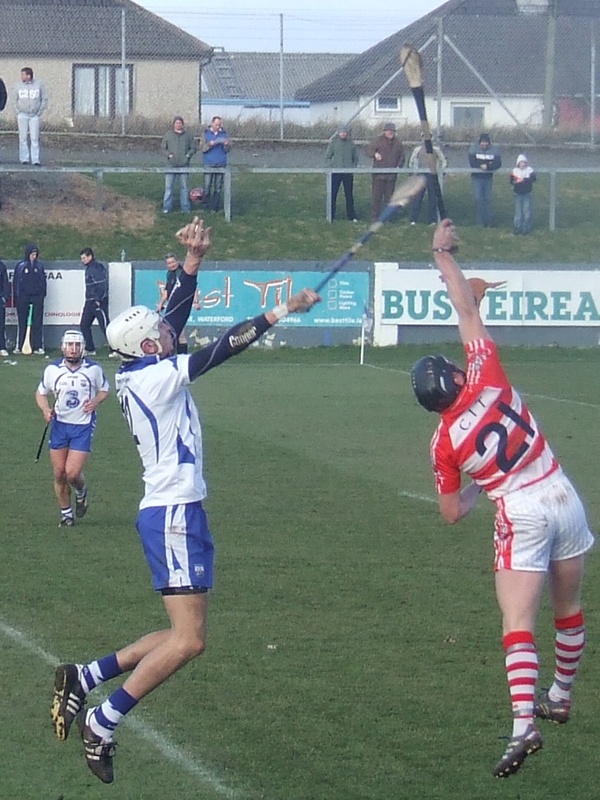 This entry was posted in Hurling, Waterford and tagged Cork, Waterford Crystal Cup on 05/02/2011 by deiseach. Sixmilebridge for the Waterford Crystal Cup is a bridge too far for me, so it seemed appropriate to use that terrible pun to accompany the lamest post title ever. Someone who might be there is a new kid on the blogging scene. ‘Deise Sports’ has started the pithily-titled Waterford GAA Blog, which if the match report about the CIT game is anything to go by – Stephen Daniels was on the sauce at John Mullane’s stag in Newcastle, eh? – should be worth following. Meanwhile, the throw-in for tomorrow’s match is 2pm. Now I really hope Deise Sports was at the game as Waterford came from 2-12 to 0-7 down at one stage to win by 2-19 to 2-18. Some potted reports from a couple of Clare fans on AFR here. It’s a wee bit disspiriting that it’ll be Cork in the final. UL would have had some novelty value, but perhaps we’ll learn more from playing Cork. Again. A further buzzkill sees O’Loughlin Gaels win the Leinster club championship. Despite being no more successful at national level than De La Salle – two provincial titles – they will carry that Kilkenny sense of entitlement into the All-Ireland series. Prepare to be sickened. This entry was posted in GAA, Hurling, Waterford and tagged Clare, Waterford Crystal Cup on 29/01/2011 by deiseach. In all the time I’ve being following Waterford, I’ve never seen them play anyone other than another county team, so this match against Cork Institute of Technology – future collegiate chums of WIT in a future Technological University of the South? – certainly had some novelty value to it. The novelty was reinforced by the presence of Stephen Daniels – future Waterford half-back? – on the CIT panel. And thank goodness there was that much novelty because there wasn’t half as much as you might have expected in the Waterford team. Those of us hoping for a swathe of young Turks about whom to get unreasonably excited were going to be disappointed. I’d heard of Frank McGrath, having worked with his father back in the dim and distant past, so I know he won the Croke Cup with De La Salle back in 2007, which left Darragh Fives and Chris Ryan as the only players of whom I’d heard nothing. Then McGrath was swapped for Liam Lawlor on the starting XV so even that little bit of unfamiliarity was lost. You’ve got to wonder what Davy Fitgerald thought this game was going to tell him about Michael Walsh that it was so essential to parachute him in as well before the start. The game started off with Jamie Nagle shipping a bone-juddering challenge which required some on-pitch repairs and may have affected his overall performance because this was not going to one of his finest 70 minutes. CIT hit a couple of wides before Stephen White got on the scoreboard for them, then Richie Foley hit a relatively easy free wide which would be a recurring theme in the first half. Michael O’Sullivan had a goal change in the sixth minute for CIT, pouncing on some loose play in the Waterford backs but he wanted to take one step too many and ended up throwing the ball having been crowded out by the Waterford defence. Foley finally got Waterford on the scoreboard in the seventh minute from a rather soft free after a foul on by Maurice Shanahan. Ryan Clifford got in on the bad free-taking act with a woeful effort. He made up for it somewhat in the ninth minute, knocking over a free after Liam Lawlor had fouled. Maurice Shanahan made his contribution to the blooper reel, trying to swat the ball through the posts from the free he had won and only succeeding in dragging it wide. Patrick O’Connor scored a good point on the run after Nagle’s clearance had been blocked and CIT were two points up after ten minutes. Waterford were looking ragged, Gary Crotty spurning a good opening by giving a horrible pass to Seamus Prendergast, Nagle at one point treating the ball like a bar of soap then hitting a terrible sideline that allowed CIT to go straight onto the attack. The referee was punishing any suggestion of over-carrying at every opp[ortunity – a new dispensation for 2011, perhaps? – and it was an instance of this from Foley that allowed Clifford to get CIT’s fourth point. They weren’t exactly firing on all cylinders themselves, falling victims to the ref’s pedantry more than Waterford, but they were accumulating more moments of quality especially in the forward line where they looked full of typical Cork nippy Joe Deane-types. Dissent from a Waterford back moved Clifford into scoring range in the eighteenth minute from which he duly profited and Tony Murphy capitalising on that nippiness with a point after excellent combination work from the forwards to push CIT five points clear. All Waterford had to show for that middle period of the te half was another pair of wides from Foley, one from a free and another after Prendergast had served it up on a plate for him. That would be the last piece of bad play from him though. If changing his shirt from 11 to 31 had anything to do with it then I vote he should have a blood injury every week. Maurice Shanahan tacked on a point in the 26th minutes from a free well-earned by Stephen Molumphy then Prendergast got our first point from play, an excellent strike from out on the right to trim the lead to three. O’Connor scored on the run to push the lead out to four then he failed to capitalise on some dire Waterford defending, knocking a simple chance wide. He added another point in the thirty-fourth minute and Murphy scored from a free to leave them six points up approaching half-time. A fight broke out over not-very-much and the ref thought it wise at that point bring the half to a close. It had been grim stuff, and you hoped that it was the wind or the extra preparation for the Fitzgibbon Cup that accounted for the difference in quality. Surely a team with so much experience weren’t about to by stymied by a bunch of Under-23s, were they? The answer came within a couple of minutes of the restart, Gary Crotty rattling over a point within seconds then Foley slotting over a free. Two-thirds of the first half total in the first ninety seconds – we could relax. Shane Casey almost unlocked the CIT defence with a mazy dribble and even a splendid pivot-and-strike point from Murphy could disguise that CIT were already huffing and puffing, Stephen White hitting s shocking wide when it seemed easier to score. Maurice Shanahan waltzed past the half-back line but opted to turn back into trouble when it required him to put the head down, but Foley added a long range point from a free. Then another free from way out dropped in short and resulted in another free. This was definite goal range and with the wind behind his back, both literally and figuratively, he was bound to go for goal. I didn’t see his shot – that’s the price you pay for trying to bet a decent photo – but the crowd told me all I needed to know. 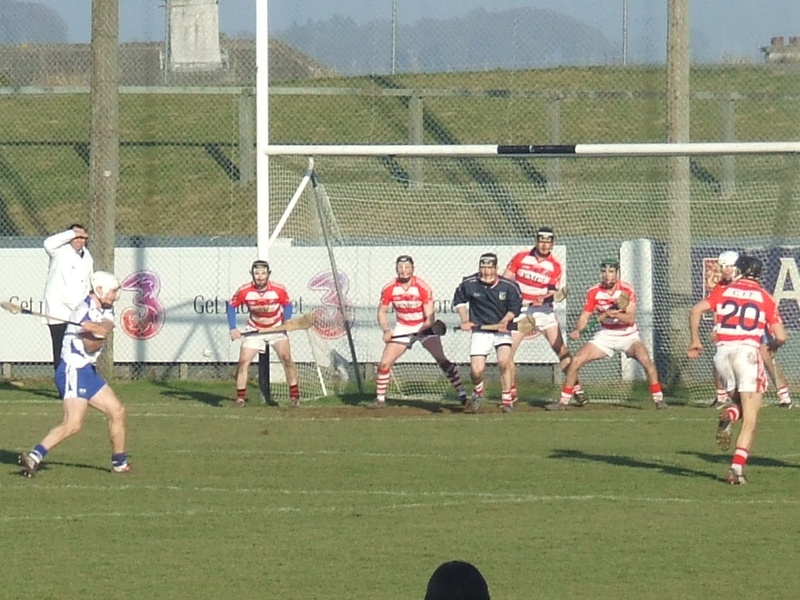 CIT scored a good point in the forty-sixth minute, Colm Casey turning Jerome Maher inside out to draw the free which Clifford put over, but that was the last point they’d score in the game. Brian O’Halloran scored an all-my-own-work point to reduce the gap to one then, after a long pause while the ref consulted his umpire over . . . something in the CIT square, it was hard to tell, Foley drilled over a long range free to level matters. There was nothing decisive about Waterford’s performance, merely an overwhelming accumulation of pressure which suggests that it was the wind that had accounted for their six point half-time lead. Or perhaps they ran out of puff. Both DIT and UCC had big half-time leads against Galway and Cork respectively and ended up losing. Whatever it was, Waterford were now in charge. Foley, who has really in the zone now, heaved over a long range point and then added another from a free after Prendergast had been tripped. You would think Waterford would have been put out when Maurice Shanahan was sent off, probably for a wild pull in the middle of a 15+ man scramble for the ball, but it had little impact on the flow of the game. It seemed to become a little more open, the ball pinging from one end of the field to the other with abandon for a few minutes without anyone getting a sniff of the posts. Eventually it all ended with another free and another point for Foley. Three points up and you felt CIT would be there all day and wouldn’t get a goal so it was time to sit back and enjoy the finer points of a game such as a Michael Walsh breakout which had all the panache of Serge Blanco in his pomp. It’s nice to have the time in a game to be able to do that because generally you are constantly fretting, even in a supposedly-meaningless Waterford Crystal Cup game, that if Waterford screw up the knives will be out, both in the media and internally in the county. It’s a hard gig, following Waterford. Then you see a titan like Walsh giving it their all purely for your pleasure and it somehow all feels worthwhile. Enough cod philosophy. Foley knocked over the insurance point in the sixty-eighth minute giving him a matchday haul of 1-8, albeit entirely from frees. It was hardly a vintage performance and it would have been nice if some now blood had made an impression, although it’s good to see Eamonn Murphy, so good with the Minors last years, in the frame. It’s early doors, and avoiding humiliation will do for starters. 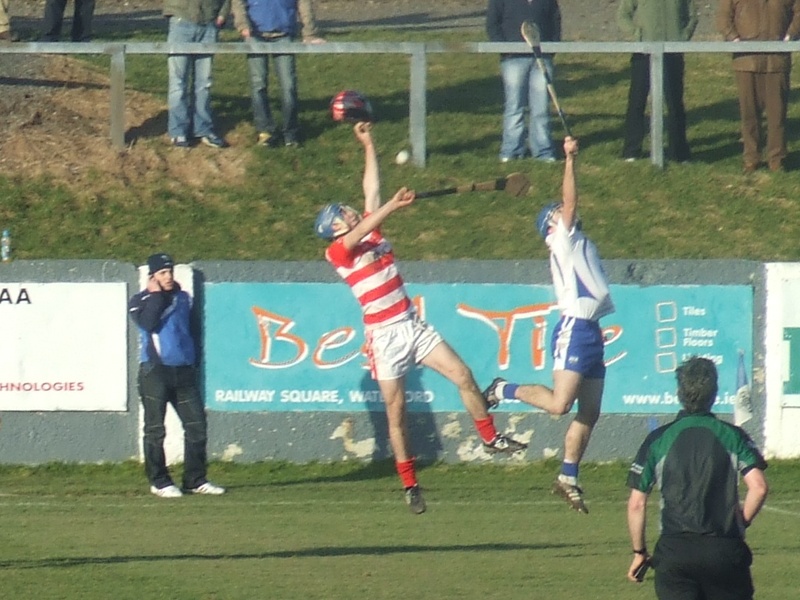 This entry was posted in Hurling, Match Reports, Waterford and tagged CIT, Walsh Park, Waterford Crystal Cup on 23/01/2011 by deiseach. This entry was posted in Hurling, Waterford, Waterford gallery and tagged CIT, Walsh Park, Waterford Crystal Cup on 23/01/2011 by deiseach. An Moltóir has never concealed his lack of faith in Davy Fitzgerald’s stewardship of Waterford, so if he is waxing lyrical about Davy’s handling of players trying to break into the panel . . .
To give Davy credit, he has devoted much more attention to developing some depth in his squad than his own predecessor did. A wide range of players were given a decent chance to show their worth in this year’s Waterford Crystal and National League competitions, and a much more inclusive approach to squad training produced a situation where some observers have suggested that Waterford’s second team is now better than most intercounty first teams. Tomorrow will see the first teeny step of 2011 although the absence of just about everyone on that list due to club/college commitments or injuries leaves Waterford fielding an experimental team against CIT. In other words, we won’t learn much but I can think of worse ways to spend a fiver. This entry was posted in Hurling, Waterford and tagged CIT, David Fitzgerald, Waterford Crystal Cup on 22/01/2011 by deiseach. With top soccer managers treating their domestic cup competitions with varying degrees of disdain, Brian Cody has cornered the market on the notion that you go out to win every game, reasoning that winning – and, more importantly, losing – are habit-forming. So you have to hope that Kilkenny’s recent loss to Antrim fits into his paradigm. On the other hand, you have to hope the beating Waterford got yesterday at the hands of Tipperary is the exception that proves the rule. The ‘experimental’ nature of the Waterford lineup is a source of comfort, and if you can’t experiment in the Waterford Crystal Cup, when can you experiment? But the problems in the full-back line is the itch we can’t scratch, and this game doesn’t suggest we have the materials in the lab to bring about a successful result to the experiment. As always, time will tell. This entry was posted in Hurling, Waterford and tagged Templemore, Tipperary, Waterford Crystal Cup on 28/01/2008 by deiseach.